The National Merit® Scholarship Program is an academic competition for recognition and scholarships that began in 1955. High school students enter the National Merit Program by taking the Preliminary SAT/National Merit Scholarship Qualifying Test (PSAT)–a test that serves as an initial screen of more than 1.5 million entrants each year–and by meeting published program entry/participation requirements. Of the 1.5 million entrants, some 50,000 with the highest PSAT Selection Index scores (critical reading + mathematics + writing skills scores) qualify for recognition in the National Merit® Scholarship Program as either a Commended Student or Semifinalist. 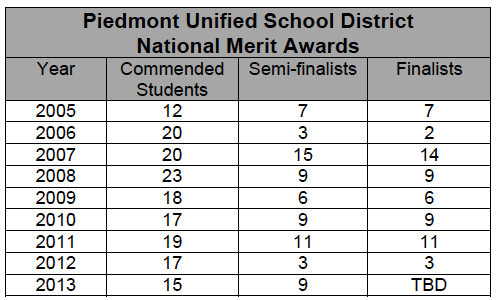 Piedmont Unified is proud to report that 15 students earned a “commended” score and 9 PHS students were recognized as “semi-finalists” for their superior performance on the PSAT. Congratulations to the following semifinalists: Remy Afong, Thomas Horn, Alexander Krenitsky, Andrew Moy, Drake Palmer, Jackson Roberts, Samuel Thacher, William Thacher, and Eric Zhang. 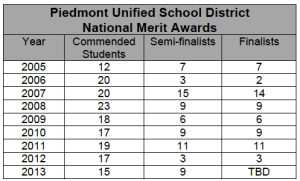 Since 2005, the Piedmont Unified School District has produced 294 National Merit Nominees, with 61 moving on as Finalists. More than two-thirds (about 34,000) of the approximately 50,000 high scorers on the PSAT receive Letters of Commendation in recognition of their outstanding academic promise. About 16,000 students, or approximately one-third of the 50,000 high scorers, are notified that they have qualified as Semifinalists. To ensure that academically talented young people from all parts of the United States are included in this talent pool, Semifinalists are designated on a state representational basis. They are the highest scoring entrants in each state. To become a Finalist, a Semifinalist must have an outstanding academic record throughout high school, be endorsed and recommended by the school principal, and earn SAT scores that confirm the student’s earlier qualifying test performance. The Semifinalist and a school official must submit a detailed scholarship application, which includes the student’s self-descriptive essay and information about the Semifinalist’s participation and leadership in school and community activities. Approximately 15,000 Semifinalists will advance to the Finalist level and it is from this group that all Merit Scholarship winners will be chosen. ← Everyone’s Favorite School Topic: Homework!